The wind directions are mostly south-westerly during large part of the year whereas during winter they are northeast to north. During the winter season the Winds are light and variable but in summers especially around May to July strong winds prevail in the most parts of Rajasthan. 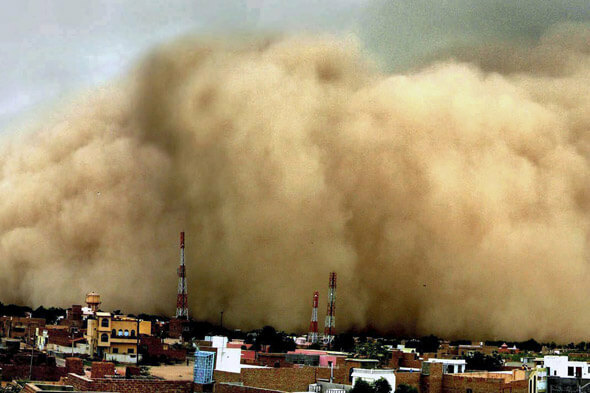 Summers witness severe dust storm period too when the wind speed rises up to 60 kilometer per hour causing erosion from the dry soils. There is a direct link between wind velocity and seasons. The wind speed reaches the highest in the month of June, which starts rising from the month of April. The wind speed starts gradually decreasing and comes to minimum in the month of November. In the Western Rajasthan, Jaisalmer has the highest mean monthly wind velocity followed by Jodhpur. On the eastern side Jaipur has the highest mean monthly wind velocity. For the most of the days during a year the Wind speed remains 1-19 km per hour all over the State (Indian Meteorological Department, 2010). For the occurrence of both thunderstorms and dust storms convective activity is essential. When the moisture is insufficient in the atmosphere, dry thunderstorms or dust storms occur. Dust storms are mainly confined to the summer months of March-June. The maximum occurrences of thunderstorms are during July (with approach of Monsoon) in the state and minimal in the months from November to January. The average number of days of thunderstorms during the monsoon season is about 11 in West Rajasthan and 10 in East Rajasthan. The average annual number of thunderstorms in the West and East Rajasthan are 17.0 and 15.0. Hail is sometimes accompanied with Pre-monsoon and monsoon thunderstorms. There is a very systematic manner in which the seasonal variations of atmospheric pressure take place over the state, with a maximum in the winter (January) and a minimum in the monsoon season (July). Except during the late summer and monsoon season the pressure gradient generally remains weak over the state. During winters the higher pressure is to the north and during summers the pressure decreases from south to north in Rajasthan.